Binder and CD-ROM package, $99. 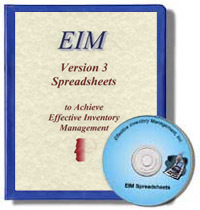 This spreadsheet package will help you implement the principles in Achieving Effective Inventory Management. Completely updated and expanded, this third edition of the spreadsheets features the newly designed Inventory Performance Simulator, which combines the analysis performed by several of the previous spreadsheets. For items with recurring usage, identify the best forecast formula from among nine methods preloaded into the spreadsheet; calculate the forecast and suggested replenishment parameters. For items with sporadic usage, calculate normal quantity sold/used in one transaction as well as minimum and maximum quantities. Compare your current inventory value, turnover and return on investment to potential ideal values. You can then see how varying safety stock and other parameters will affect your service level and inventory investment. Employ user maintained controls to smooth out unusually high or low usage. Graphically review the history and suggested replenishment parameters of a specific item comparing the results of all 11 forecasting methods. Planned excess (what vendors force you to buy in excess of what you need). If a vendor offers you a lower price per piece for a larger purchase quantity, is it a good deal? This spreadsheet will help you make an intelligent decision. It compares the lower cost per piece to the cost of carrying inventory for a longer period of time. It also takes into account the lower reordering cost per unit resulting from the purchase of larger quantities. The price break that provides the lowest Total Cost/Piece represents the best buy quantity. This spreadsheet compares the discount you will receive to the cost of carrying each purchase quantity for the length of time necessary to sell the entire amount (based on your current overall forecast for the vendor line). The result is a calculation of how much each dollars worth of inventory will cost when you consider both the discount and carrying cost. The lower the cost of a dollars worth of material, the better the deal. With this spreadsheet, you will be able to consider freight, terms discounts and extended terms to decide which of three entered purchase quantities represents your best buy quantity. This spreadsheet determines the amount of additional sales your company must generate to make up for the value of material that is lost, stolen or otherwise unusable. Each of the spreadsheets is provided on a single CD-ROM, along with hard copies of the spreadsheets, and detailed instructions, all packaged in a sturdy binder. A featured speaker at international seminars and conventions, Jon has earned the title of Inventory Subject Expert from the American Productivity and Quality Center (APQC). If for any reason you are not totally satisfied with Spreadsheets to Achieve Effective Inventory Management, simply return it within 30 days for a complete refund.